Brec Bassinger dating life is quite under the radar as she is reluctant to share her personal life out to the media. Being the popular face of the Disney stars, Brec's love life is one of the stories people tend to follow. Is she single or taken? Let's find out along with her past affairs and relationships. Brec Bassinger is an American actress, best known for her role as Bella Dawson on the Nickelodeon series 'Bella and the Bulldogs.' Bassinger used to be in beauty pageants and was the Our Little Miss World Winner. She is also known for her series like 'The Goldbergs', 'The Haunted Hathways', 'Bella and the Bulldogs', 'Liar Liar Vampire', 'School of Rock', and 'Status Update'. Is Brec Bassinger dating someone? Or, is she single? 'Bella and the Bulldogs' star Brec is currently single. Although rumors tell that she has romantically linked with her cos-stars. How much is it true? Let's figure it out! "I immediately knew they were going to have me kiss a guy in the show. At first, I didn’t want my first kiss to be on screen. Then, I realized this wouldn’t be my first kiss; it would be Bella’s. But that didn’t stop me from being extremely nervous,"
Later she was even seen hanging out with Matt. They went to a baseball game together and posted their picture of their well spent day on Instagram. Through the post, it led people to believe that there is more than friendship between these two. Who knows if they are secretly dating? Well, time will tell. The 18-years-old Brec is the perfect blend of beauty and intelligence and someone like her to be single raises tons of questions to the people's mind. She is constantly asked on Twitter and other online social sites, and she also replies them all in a pretty spicy way. Now it's 2017, still, Brec is single at the moment. But her dream definitely came true last year and dated a guy for few months. It was only months Brec posted on her Twitter wishing for a boyfriend and her wish did came true with the 18-year-old Puerto Rican actor Ricky Garcia. The couple began dating in October 2016 and their love affair captured many viewers attention after all they were such a cute couple. Ricky is the actor of the Disney series 'Forever Boys' in which Breck is also starring alongside him. Their dating news got confirmed after the Brec was seen attending Ricky's 18 birthday party. According to the dating profile of Brec, she had a love affair with Ricky for ten months. 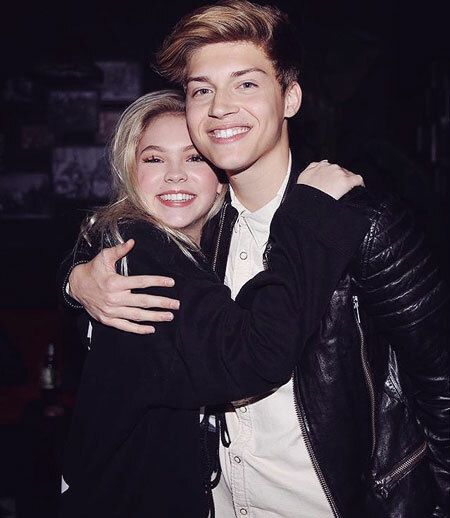 Now Brec is single again and by Ricky's dating timeline, he is also said to be single at the moment.